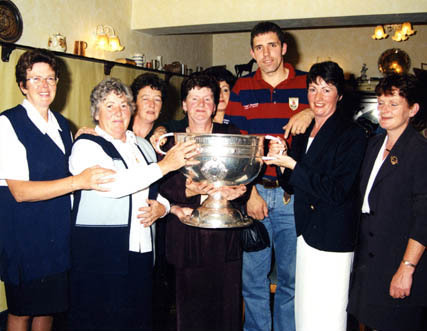 Sheila with friends and "The Sam Maguire"
Members of the Oughterard Golf Club will remember with great fondness Tom and Sheila Morley for the outstanding contribution they made to the development of Oughterard Golf Club since its foundation in 1972. Tom was captain in 1983 while Sheila took on the task as Lady Captain in 1984. Tom was President of the club for two years from 1992-1993. My first encounter with Tom Morley was when he came to our home in 1967 and asked Frank would he help him form a Tourist Association and act as secretary. Frank agreed if their prime purpose was to form a Golf Club for the area. 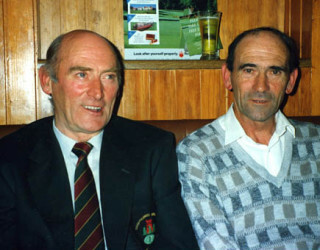 On the 17th January 1968 the first general meeting of the association was held in the Muintir na Tire Hall (Hibernian Hall, Camp St.) It was known as “The Oughterard and District Tourist and Development Association.” The Association soon learned that a private company had purchased land from Lily Willis and intended building a Golf Club. Tom, Sheila and many more supported the company as they saw the potential and numerous benefits a golf course would bring to this area. Up until 1982 the Company undertook very little development work. The period 1982-1986 saw the course and clubhouse facilities under the ownership and control of members, undergo a dramatic transformation. Tom and Sheila were part of that great change contributing freely and unselfishly of their time, talent, energy and indeed financial assistance. Tom under took the difficult task of constructing a new nine holes bringing the course to an eighteen hole, 6040yards, par 70. The work was intense as woodland and bog were reclaimed to make way for fairways, the building of attractive stone faced tee-boxes, and of course the construction of nine new greens with an excellent putting surface. This period also saw the installation of an automatic irrigation system and the construction of a machinery shed and workshop. All of this development and reconstruction work was achieved without recourse to additional borrowing. With members support the club successfully sold two, 2000 tickets for car draws raising £140.000 in the process. Sheila in particular made an enormous contribution to both draws selling numerous tickets. She also organized a Sale of Work in the Community Centre. She bought the contents of a shop in Athlone that suffered smoke damage during a fire. We helped her wash all items, baked cakes, served tea/coffee and cakes and raised over £3000 for the club. Nothing was too much trouble for Sheila. On the golfing front both Tom and Sheila represented the club on various teams. Sheila was on the panel of the winning Burren Ladies teams 1981 and 1988 and the Mixed Foursomes Team who won a Connacht Title 1993. Tom assisted Frank Kyne in 1993 when they became Connacht Jimmy Bruen Champions. Both Tom and Sheila led a fruitful and fulfilling life sharing their gifts and talents with all of us. They were ever ready to take new members out on to the course and help them get started in golf. 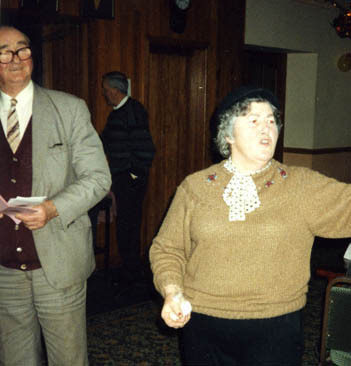 Sheila was President of the Oughterard Bridge Club and was a keen 25card player. She was a familiar sight at most 25 Card Drives winning numerous encounters playing against the best. She was a keen artist and painted several pictures of the Bridge over the Owenriff River near her home. Sheila, a keen gardener, shared her plants and garden produce with neighbours and friends. She produced so much food in her little glass house. Sheila’s artistic talents manifested themselves in the delicious meals she cooked. Sheila shared the experience gained in the Boat Inn with all of us when we started catering for visiting golfers in the 70s. 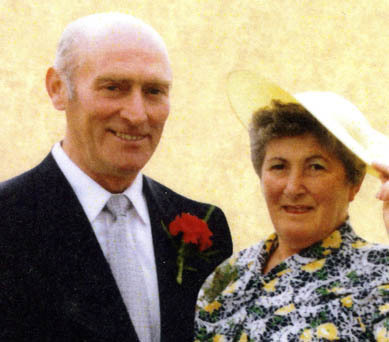 Sheila was renowned for her sumptuous buffets and barbeques that we enjoyed at her home, on the shores of Lough Corrib at Birch Hall and after a day’s golf in Portumna. She had a knack of turning plain food into a banquet. There was always banter, fun and laughter associated with everything Sheila undertook – whether it was playing 25, putting a bet on the horses, getting that spectacular hat ready for the Galway Races, collecting elderberries and sloes for her home brew, breeding rabbits, taking care of her beloved dogs “Bobby” and later on ‘Joey’, collecting mussels in Leenane and Ballyconneely, fishing in the early morning for sea trout, taking the boat out in stormy Lough Corrib when no sane angler would venture out, dancing the night away at the Golf Club parties, choosing girls for the Queen of Connemara Festival in dance halls around Connemara in the 80’s, attending Daniel O Donnell concerts or following the antics of the latest Irish craze ‘Jedward’ – there was no end to the wonderful experiences many of us had the privilege to share with our beloved Sheila. We all miss her. Tom was more serious than Sheila (or so we thought) but they complemented each other. He was an honest decent, kind, good man who would never see his neighbour in want. He was always there to lend a hand in his own quiet way. In later life Sheila was particularly proud of her grandchildren. She spent time with all of them passing on her culinary skills and her special golf swing to them. She spent many wonderful weeks in New Zealand with Tony’s family. I was eternally grateful to her when she welcomed me at Tony and Jan’s beautiful home in New Zealand when my traveling companion and I were without accommodation. At 1.30am she opened the door “ I would say Kyne you were never as glad to see me as you are now. Come in I have a shepherd’s pie in the oven for you,” she greeted us. This was typical of Sheila. Sheila made many friends in New Zealand. She left an impression on everyone she came in contact with. Tom and Sheila fought the good fight. They used their God given talents wisely for the betterment of all they met in their journey through life. They were true workers for God’s Kingdom. Ní bheidh a leithéid an arís. Guímid suaimhneas síoraí dóibh imeasc na nAingil i bhFlaithís Dé.